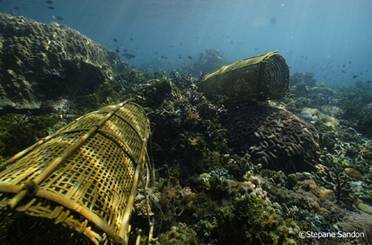 Alor’s reef is still in a really good health. However conservation stays a major issue face to on-going development. First of all, the local fishermen traditionally use quite sustainable fishing practices (lines, harpoons, bamboo traps …) to catch fish for their own consumption and the local market, Moreover, thanks to the remoteness, the tricky currents and also the beliefs in strong “magic” power of Alorese people, disrespectful fishermen from further archipelagos are not brave to come around. For instance, end of the nineties, some fishermen using dynamite coming from western archipelagos have been chased away with bows and arrows by the locals… All this had so far limited the damages as well as overfishing. However, since a few years dynamite fishing has some clients, and even if 99% of the local population doesn’t agree with this disastrous practice, it becomes important to avoid the irreversible damages caused by a few careless persons. This illegal practice has to be controlled by the local authorities, by the community awareness, and an efficient policy to break-up the market. Besides, some practices drifts have to been controlled, such as intensive use of bamboo traps or their mooring with long ropes, or wild anchoring on the reef, not only from local boats but also from some diving boats or liveaboard. Alor-Pantar strait has been declared by Alor district as a “marine park” in 2001. Later on, activities have been regulated in a purpose of conservation in 2006, and in 2010 majority of Alor archipelago has even been declared as a « national marine protection area ». But operational organization is still at a paper work stage and effectiveness is still a big challenge. Dynamite fishing still occurs in remote spots, and there is still some species collected for commercial use despite regulation. That’s why we always believe comprehensive relationship, daily dialogue and share of knowledge have positive impacts. It looks like an evidence but… Boat anchoring is sadly a notable cause of extensive damage of the shore ecosystems, especially coral reefs but also sea-bottom habitats. Small fishermen boats will tear-out small coral formations in shallow parts, and bigger boats will pull-off bigger ones in deeper waters. Only small sampans anchored with stones have limited effect, but still … and what a shame to see a diving cruise boat throwing its anchor down the reef, while they is even regulation (anchoring is actually forbidden in Pantar strait). For that, we had set a few mooring buoys (only in a relevant spot to avoid overfishing due to facilitated access!) and always let the boat drifting instead of anchoring. 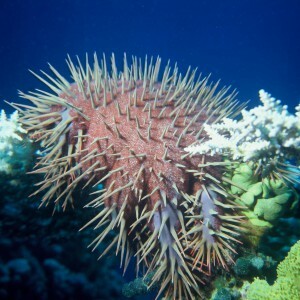 In 2006-2007, some Crown of Thorns (Archantaster Planci) outbreak occured in several sites. 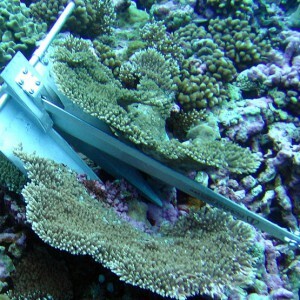 This coral predator can be responsible of reef bleaching. We collected as much as possible and tried to aware the different stakeholders (fishermen communities, local dive operators, government). Some of them got involved in further collection. Thanks to this early control (or by chance !) the outbreak staid at a minor stage. The damaged sites recovered after +/- 3 to 5 years. But we stay aware and unfortunately we regularly need to collect a few of them. We beleive routine small actions are changing minds. 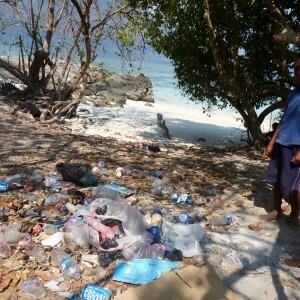 That’s why we collect the trash washed-out by the sea after rain or even left on the beach by people, by ourselves or with Kepa’s village kids which is another occasion to talk about the impact… At occasion we also take for diving specific institutional stakeholders (government or NGOs expert teams, police chiefs, …), and we take care that our customers have a responsible behaviour underwater, taking care about their fins control, about what they touch with their hands or their bubbles. Nobody’s perfect, but everybody should keep trying !